The Book of Job is, I think, very underrated in Christian estimation. It is written as a work of poetry, and as such it is difficult to read casually. For most of my life, I only knew of Job through the paraphrased versions taught in Sunday school, which only drew from the first and last chapters and skipped all the heavy stuff in the middle. Job, I was taught, is all about understanding suffering as a test of faith, and that those who pass such tests are rewarded. What those lessons did not teach was the middle section of Job, which is heavy poetry with questions about whether God is good and/or just. Now, Job is a whole book, and so the quickest option I can offer you for purposes of my blog is this video or these excellent SparkNotes, which paraphrase Job in a more complete fashion. I mention the Book of Job because there were passages in Surah al-An’am that used very similar language to describe God. They cite things like astronomy, plants and terrain, the patterns of the weather, and other forces that mankind cannot control but is dependent upon as evidence with which to judge the character of God. While Job and al-An’am are written to serve different purposes and narratives, they do show similar understandings of God. I think the best starting point for this analysis is ayah 74, which tells the story of Abraham’s search for God. He first rejects his own father’s practice of idolatry and then looks for a god by watching the sky. First he sees a star, and declares that it is his god, but when the star sets Abraham is dissatisfied and denies that anything so transient should be worshiped. The same process happens with the moon, and this time Abraham feels dismayed at his own gullibility. When the sun rises, Abraham praises it as surely the greatest thing, but when it sets Abraham renounces associating any thing with God. The hidden meaning seems to be that even if the greatest conceivable thing is transient, then nothing conceivable can be God. Abraham declares that he believes only in one creator, refusing to partner anything with that creator, and claims that God has guided him to this conclusion. The story has a very folk tale feel to it, for surely Abraham had seen the stars, moon, and sun before, but it is interesting that there are no miracles. The moral of the story is that it was through Abraham’s own ration that God provided guidance, and this further discredits the need for the miracles that Muhammad’s pagan neighbors have been demanding of him. ِAyah 97 calls the features of nature clear signs, assuming that such signs should guide people to understanding the true God. Ayat along these lines have appeared in our earlier readings, but always in such isolated incidents that I did not pause to review them. This surah devotes longer sections to examining nature in order to evoke the omnipotence, power, and benevolence of God. They don’t really use any path of logic, requiring you to already believe in God to be impressed by them, but for the person who already believes they would be educative and inspiring. Some passages describe God as being directly involved in the workings of nature, bringing plants out of seeds and raising the sun in the morning. While some people might cynically say that is just superstition formed from a lack of scientific knowledge, it is important to remember the lesson from Abraham’s conversion: God’s influence can manifest through a natural process. So while plant seeds have their own scientific processes, God is still understood as the author of those processes and still gets the credit. (This is back to free will vs. predestination: are we doing things for ourselves, or just experiencing things God has already determined?) The surah tends to focus on benevolent things of nature, like crops and celestial navigation, that people rely on but have little to no control over. Behold, the Hejaz region of Arabia, from whence Islam came. Indeed, any nature that helped you live might look miraculous here. So the Quran teaches that God’s existence is self-evident in the natural world and that you can learn about Him by looking at nature. This is not an argument absent from Jewish or Christian scriptures, and one I have pondered in my own time quite a bit. I think I like the Book of Job (Kitaab al-Ayub, in Arabic) in part because it takes in so much of nature to explore God’s character. While al-An’am mostly draws on things that help mankind live, Job also looks at things that destroy. The monsters “behemoth” and “leviathan” are sometimes translated as stylized hippos/rhinos and crocodiles, but othertimes they are read as allegories for the seen and hidden destroying forces of the world. Either way you look at it, they are unfriendly to humans, and yet God says He created and takes pride in them too. This could imply that humans were not His only focus when He created the world, and it puts humans in a humbler place. It reminds me of documentaries where one sees a lioness hunt down and kill an antelope. I used to always watch those documentaries with a sense of horror for the antelope, and yet the documentaries taught me that there was good in this. So with that I want to indulge in an almost tangent. Bear with me, and I’ll tie it back in soon. Have you seen this video? By standards usually set for pro-conservation advertisements, this is an odd one. Most other ads try to manipulate emotions by showing incredibly appealing elements of nature to make people feel affection, or by emphasizing human guilt in order to motivate people to change their ways and give support. Both of those messages are human-centric, implying that nature is dependent on humans. By contrast, this video brashly brags how nature created humanity but doesn’t need humanity, how it is helpful and yet apathetic to human survival, how little actual dominion and knowledge humans have to the workings of the natural world, and how humans are destined to doom unless they make a choice to serve nature and prolong their own existence by doing so. This video aims to make humans become humble, pragmatic, and thus reasonable in face of the impartial truth. If there is an emotion it is trying to inspire, it is fear and awe. Now, I bring up these because it strikes me that religious groups often describe God in the similar ways. Very often they emphasize the likable traits of God that will draw people into feeling affection for Him. Sometimes they emphasize human guilt in order to convince people into obedience to Him. Rarely (in my own experience with Christian groups) do they emphasize the absoluteness and utter otherness of God. To Christians, God is so emphasized as loving or judging that it even feels strange to consider Him having an existence that wasn’t centralized around humankind. One might almost question that if we weren’t around, would God have any reason to exist? This is not inherent in our beliefs. One of my favorite things about how God described Himself to Moses is that He didn’t use a role relative to humankind (ex. Lord, Father, God) but named Himself as “I Am That Will Be.” Jesus taught that God was not dependent on any particular group of men when he told his fellow Jews, “And do not begin to say to yourselves, ‘We have Abraham as father.’ For I say to you that God is able to raise up children for Abraham from these stones.” Paul argued God’s existence to the philosophical Athenians by emphasizing His self-evidence in nature and existence apart from humanity (Acts 17:22-32). However, Christianity has a focus on comforting human suffering. It is not generally a comfort to say “Your suffering isn’t particularly relevant to God’s existence.” So lessons of God’s otherness, while true to our beliefs, are not central to our dialogue. The absoluteness and utter otherness of God is prominent in the Quran’s dialogue. Passages have taught that God does not need men’s praises, only that He deserves them. The reality of God is something men are invited to take or leave, although there are consequences for both choices. No particular individual matters to God, for if someone loses faith He will simply replace them with a new believer. God even tells the Meccans to look at the ruins of fallen civilizations around them, and brags how He has created and destroyed greater people than they. 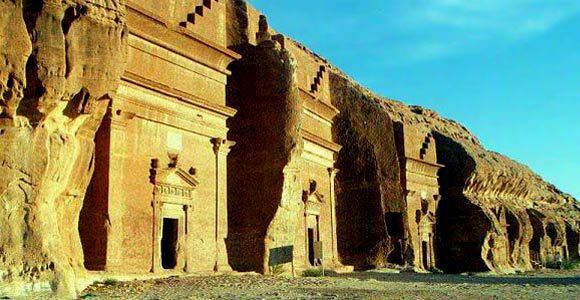 Nabataean ruins along the Arabian trade routes would have surely impressed that fact. One could argue that much of the Arabian peninsula testifies to its people about how little their existence matters to the forces of nature. If they were called to look at nature to understand the character of God, it might not be surprising that they trended towards viewing God as impartial to individual human existence. Of course, looking at nature can also lead to other conclusions than Abraham’s monotheism. Many people today are inspired towards atheism when they explore nature, finding science to be self-sufficient and apparently devoid of spiritual interference. Even on the religious side, people have formulated that different natural forces were manifestations of clashes between various governing deities. Moreover, other forms of monotheism could be developed, like Hinduism’s Brahman, which resembles more of a super-force or transcending substance that blurs the lines between creation and creator. The Quran doesn’t acknowledge these other possible lines of thought, much in the same way that Abraham never considered there being more than one god as he watched the sky. It is subliminally acknowledged that looking at nature does not provide sufficient guidance, for God is said to send prophets to prevent men from claiming innocence-through-ignorance. Such would not be necessary if nature was a sufficient teacher. Miracles, natural evidences, and revelations have all been called at different points ayat, which you’ll remember means “signs.” It makes some translations a little more fuzzy to my amateur eye, since many times the word ayat gets translated into “verses” or “revelations.” Why cannot ayat also mean natural evidences? If ayat can also be used to describe natural evidences, does this mean that natural investigation can have equal value to scriptural study? How might this affect the meaning of verses where God declares wrath on those who turn away from His signs? There might be some morphological difference around the word that I don’t know, and certain verses have context that makes “revelations” the more likely meaning (as in ayah 157), yet it’s interesting to consider what other potential meanings could be understood in the original language. At any rate, the Quran still regards itself as the only sign really needed, since it not only provides knowledge of God, but also tells humans how to morally live (something that nature arguably teaches little about). I don’t know if I had any point to make when I set this topic aside for its own post. Mostly I suppose I wanted to highlight how much the Jewish, Christian, and Muslim visions of God have in common. I know that many Christians think Islam worships another God because “their God is so aloof,” but I think that quality can be glimpsed in our understanding of God too. While Quran scriptures haven’t described God as a very intimate being yet, they do describe Him as just and benevolent, which is also in line with Christian and Jewish ideas. I also wanted to spend some time reflecting on a God who has no need of my existence. I sometimes feel at odds with my religion’s rhetoric, which has so much emphasis on being rewarded for doing good (well, actually it’s more about reward for suffering while in the service of doing good). Something in me is partial to the more Jewish perspective that being good is the means and end to itself, and that one believes in God merely because He exists. That is a vastly simplified account of the Jewish belief, even of Jews in Old Testament times, but I count it as virtue that their belief was not rooted in the desired payback of an eternal reward. While I believe in the Resurrection, and am thankful to God for it, I also worry that it cheapens our faith and testimony to focus on it. If there was no afterlife to look forward to, I still would like to think that knowing the truth of God’s existence and His desire for goodness is enough to foster the better intentions of humanity.